Metamorfózy is Rune Lindbæk and Øyvind Blikstad. Lindbæk is one of the original pioneers of the Norwegian electronic/House scene and highly regarded for solo works, Those Norwegians, and his Idjut Boys collaboration-project Meanderthals on Smalltown Supersound. In Metamorfózy, Rune is working with composer and sounddesigner Øyvind Blikstad, a classically trained musicologist who has produced music for both theatre and film. 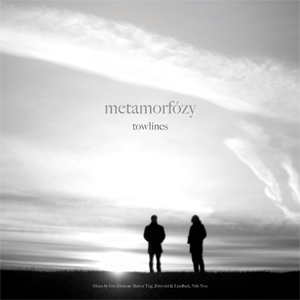 Towlines, a stunning track from their debut album Decasia, has been given some remix treatment for a limited 12” release. The first mix is another Rune Lindbæk collaboration; Frisvold & Lindbæk touch the track with their trademark whirlwind Disco treatment, reminiscent of their renowned Diskoism compilation. DJ Nils Noa, is known for releases on his own Troll label. Nils takes the track over in a more Tech-House direction. The B-sides opens with the original version and then Dr Dunk (aka Eric Duncan from Rub-n-Tug) rounds things up with a long and truly epic, balearic mix. A record of haunting beauty from the North!